One significant reason liberals don’t do better these days is because they’ve turned their backs on the sensible decentralization of government. They have forgotten the devolutionary principles of the 1960s leftists or the fact that many of their favorite issues - such matters as the environment, smoking laws, marijuana, Real ID and gay rights – rose to prominence thanks to local and state action long before there was federal interest. Instead, they tend to see advocates of local decision making as reincarnations of pre-civil rights era segregationists. This has all the logic of accusing people who raise children of being pedophiles. In fact, decentralization is not only written into the Constitution – albeit broadly ignored – but local action has been the secret behind every major social and economic policy that has graced this land. At the present time, for example, the federal government and Washington are as dysfunctional as at any period in our history. And it is a bipartisan dysfunction, bought and propelled by dysfunctional lobbyists and made to seem normal by a dysfunctional media. The obvious answer is to look down the pyramid of power and to rediscover that wise principle of subsidiarity, namely that government should be carried out at the lowest practical level. For example, such functions as Social Security, Medicare and the Postal Service are best carried out at the national level, but there is no logical – nor legal –justification for the sort of federal interference now taking place in local public education. 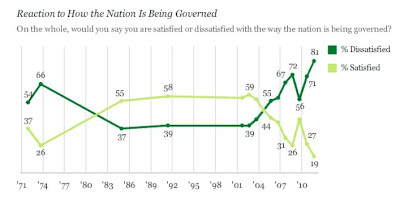 - Americans like state and local government much more than the feds. A Rasmussen report found that forty-three percent of U.S. voters rate the performance of their local government as tops compared to its counterparts on the state and federal level. Nineteen percent say state government is better than the other two. 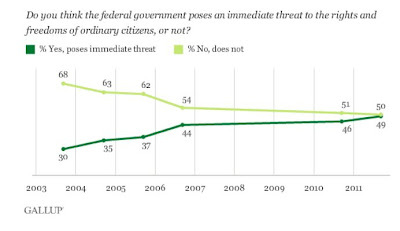 Just 14% think the federal government does a better job. 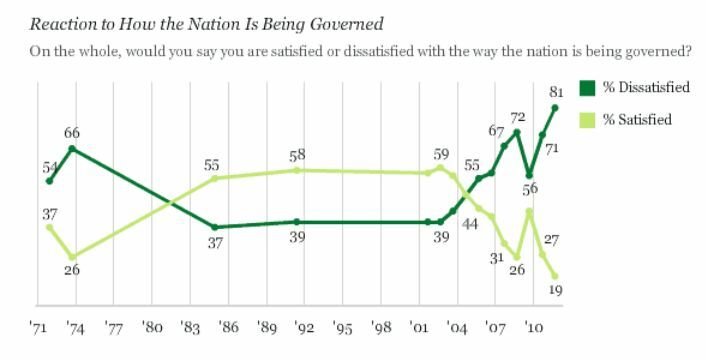 Fifty-six percent of all voters believe the federal government has too much influence over state government. 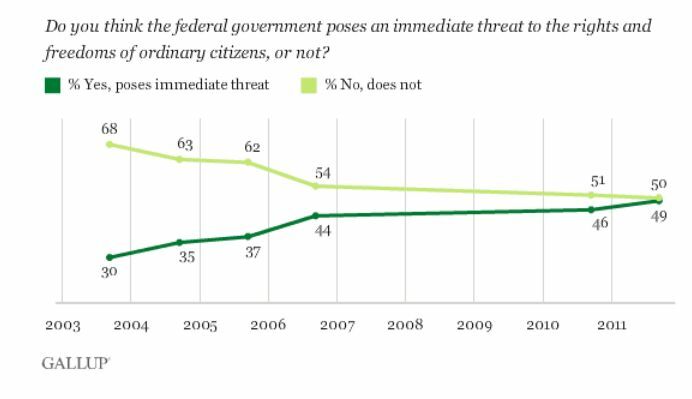 Only 12% percent say the federal government doesn't have enough influence over states. - The decentralization of the federal government can increase its effectiveness. There are a number of federal agencies that are already quite decentralized. Interestingly, these agencies are among those most often praised. The National Park Service, the Peace Corps, the Coast Guard, and US Attorneys all have dispersed units with a relatively high degree of autonomy and a strong sense of turf responsibility by their employees. What is common to these agencies is their close connection with the local. For example, one study found that US Attorneys in Las Vegas and Nashville enforced drug laws the least, a reflection of local values. - A former Peace Corps regional director told me that in his agency's far-flung and decentralized system, there was no way he could control activities in the two dozen countries under his purview, yet the Peace Corps became one of the most popular federal programs in recent times. Can the success of these decentralized agencies be replicated, say, in housing and urban development? Why not give it a try? If federal housing monies were distributed by 50 state directors (vetted like US attorneys by the states’ senators) who were given considerable leeway in the mix of policies they could fund and approve, we would, for starters, begin to have a better idea of which programs work and which don't. - The more power you give the top level of government; the more is being granted a institution. The more power you give the lowest level, the more you are giving to a community and to associations. John L. McKnight described it this way: "The structure of institutions is a design established to create control of people. On the other hand, the structure of associations is the result of people acting through consent. . . You will know that you are in a community if you often hear laughter and singing. You will know you are in an institution, corporation, or bureaucracy if you hear the silence of long halls and reasoned meetings." Here are some of the characteristics McKnight found among associations in contrast to institutions: Interdependency; a recognition of fallibility rather than the ideal; better at finding a place for everyone; lacking large bureaucracies so can respond quickly; non-hierarchical creativity. - The more involved the federal government is in directing local affairs, the greater the cost, time and paperwork. A study of Milwaukee County in 1988 found government agencies spending more than $1 billion annually on fighting poverty. If this money had been directly given in cash to the poor, it would have meant more than $33,000 for each low income family -- well above the poverty level. - Writer John Gall has said that "systems tend to oppose their proper functions." Unfortunately, complex failing systems like the federal government have little capacity to save themselves. In part this is because the solutions come from the same source as the problem. Complex systems usually try to save themselves by doing the same they have been doing badly all along -- only harder. This is because the salvation of the system is implicitly considered far more important than the solution of any problems causing the system to fail. . .
- The federal government’s own population is a little smaller than that of Los Angeles. That means it is an institution that serves two groups: the United States and a de facto city the size of LA. Which one it will be serving at any particular moment is up to it and not to us. - One of the states that has best survived the Great Recession has been North Dakota and one of the reasons is that it has its own state bank. Of course, the federal government could have a national bank, but it doesn’t and it wouldn’t be anywhere near as responsible to local conditions as a state institution. Meanwhile, the North Dakota model is begging for other states to imitate. - The further one becomes removed from a problem, the more it is likely to be dealt with in an abstract fashion. The practical is inevitably downgraded. - Our huge federal government has increased the class conflict in America. Washington has become increasingly become a job factory for those with advanced degrees, typical of only about eleven percent of Americans. The language, thinking and action of this elite subculture puts the whole government at odds with general America. It is abstract, technological, legalistic, bureaucratic, and over dependent on data collection and analysis. This is a cultural, not a political, matter. For example, one of Barack Obama’s biggest problems is not that he is black but that he is a Harvard Law School graduate who doesn’t know how to talk United States. - Liberals are afraid to criticize big government because they think it makes them sound like Republicans. In fact, the idea of devolution -- having government carried out at the lowest practical level -- dates back at least to that good Democrat, Thomas Jefferson, who spoke of the need for “little republics.” Conservative columnist William Safire admitted that "in a general sense, devolution is a synonym for 'power sharing,' a movement that grew popular in the sixties and seventies as charges of 'bureaucracy' were often leveled at centralized authority." In other words, devolution used to be in the left's bag.